Some state leaders, including Oklahoma Treasurer Ken Miller and Gov. May Fallin, both Republicans, want to change the state’s seven pensions from defined-benefit to 401(k)-styled plans, which don’t guarantee set retirement payments. They argue that overall unfunded liability of the plans, $11.4 billion, is a major problem that needs to be urgently addressed. But the Economic Policy Institute, along with the Keystone Research Group, has prepared a report that argues the state has financially bolstered and improved the pension plan system in recent years and that such a change is unneeded and even risky. The Oklahoma Policy Institute, a think tank based in Tulsa, had earlier made these same arguments as state officials began to meet and discuss changing the pension systems. The fact that some state leaders, such as Miller, want to press ahead with changes despite the growing financial stability of the pension plans make their motives suspect. Is this a case of legitimate financial responsibility or merely an ideological move by the GOP, which dominates state government, to cut the benefits of state workers to make way for more tax cuts? Meanwhile, public pension plans are under attack by the GOP leaders and operatives in states throughout the country, including California. Let’s be clear that it was unscrupulous banking practices, not public pensions, that caused the recent Great Recession. Miller has said the change would only impact newly hired state workers, such as teachers and social workers, but he has yet to advance a specific plan with mathematical models that show how the existing plans would remain solvent in coming years. (1) The report noted the state’s two largest pension plans only pay annual benefits of $18,000 and $19,000, which is not “overgenerous,” especially given low salaries here among rank and file workers and teachers. Often, those pushing for change make the argument that state employees are somehow getting better retirement deals that those in the private sector. The report provides a better perspective of that argument. (2) The report also notes that “Oklahoma employees contribute more to their state pensions, on average, than workers in most states . . .” The retirement contributions can take a large chunk out of a paycheck. State leaders often fail to mention this fact about the state’s pension plans when they make their arguments for change and instead try to focus the public’s attention on the large pensions of specific, former politicians. The bottom line is that the move to “change” the state’s pension plans is really about “cutting” benefits, at least for new workers. It’s quite possible that by cutting benefits, the state could have a difficult time attracting teachers or state workers, who haven’t received an across-the-board raise in several years. State leaders are also in the process of considering a report on public workers’ salaries and changing Oklahoma’s merit protection law. I don’t think it’s unreasonable, given the GOP-dominance of state government right now and the obvious Republican agenda of spending cuts, for any state worker or teacher to be extremely worried about all the changes now under consideration at the state Capitol. 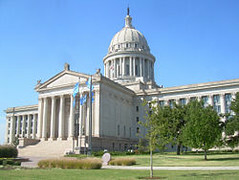 Next year’s legislative session is shaping up to be an important one for state employees.